Dynamic lighting behind and around a power plant employee helps the subject stand out from his interesting background. On-location environmental portrait photography in dark plants and factories requires special skill and strategic lighting. To focus attention on the employee while emphasizing his trade through visual details of the machines and manufacturing operations surrounding him, we created a six-light set and on-location studio. Two strobes - both lighting the furnace - are gelled to create a warm yellow glow instead of dark, cold factory look. 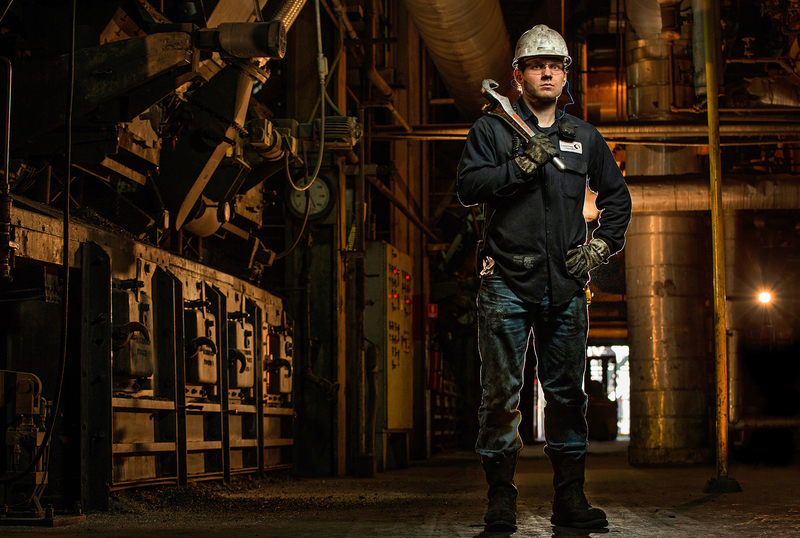 Two more strobes light the worker from behind, creating a dynamic separation from the dark background. The main light, created from a three-foot-wide Octabox, illuminates the worker. A final strobe light, positioned low and below the Octabox, helps to highlight the worker's legs. This is important, since the clothing he wears reinforces the overall story.